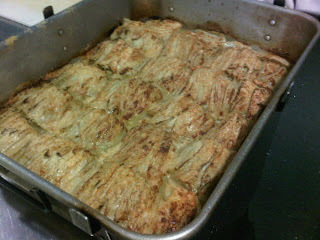 Today in our Banquet & Production class, one of the foods we made was Fennel Gratin. I truly love fennel, and I find it so underused! Today just reaffirmed my need to get fennel back into my cooking program! As my classmate Kyle put it, fennel is like "licorice celery." Fennel is known for its licorice-y flavour, but fennel is also a bit of a tougher vegetable that needs to be braised or cooked slowly and for longer times in order to soften it right up. Today’s recipe could not have been more simple - only 5 ingredients! A perfect side dish and one that is sure to wow anyone you have over for dinner. - In a roasting pan with high sides, smear the butter all along the bottom so that it covers the pan. - Add in the fennel bulbs with each half laying flat on the bottom of the pan side by side. - Cover midway up the fennel with the stock. - Cover the pan with aluminum foil and place in the oven for 45-60 minutes. - Remove the aluminum foil, and sprinkle the cheese so that it covers the fennel. - Bake for about 20 minutes or until golden brown.